« Another look to the North, Diamonds Raze a Reserve. 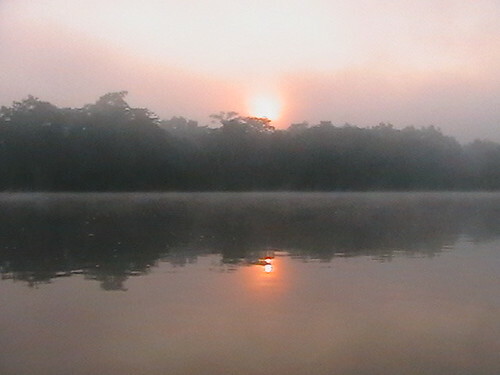 Sunrise over the Lomami River. We are about 100 km south of Opala as the river meanders. Half that much as the crow flies. If you have a satellite image (google earth) and follow the Lomami river south from Opala you will come to the last three tiny villages. They are half hidden by cloud cover. We are in the second one. -Black Mangabey – both banks of the Lomami. See a photo on Flickr and read a good San Diego Zoo article. -Red Colubus west bank only so far. See Flickr search results for a variety of races. 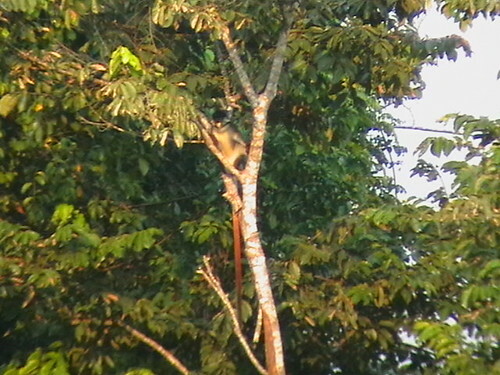 -Red tailed guenon (apparently a hybrid type) both banks. Here’s a good photo of one variety of red-tail on Flickr. Below is a photo of what I saw south of Opala. -And I think it was the Blue monkey that we saw on the east bank. Being watched by a red-tailed guenon. But here is the BIG news. We saw bonobo on the east side of the Lomami. First we heard them, a real racket. We knew right away it was bonobo and not chimp. Very high pitched. So we pulled the pirogue over as quickly as we could. I was sure that they would have fled as we maneuvered in to shore but a mother with her baby and a young “juvenile” were still visible. They were obviously bonobo with the distinct dark face. I have a few seconds of video of the mom with her baby. Our location is good for a base camp. These are the coordinates S01.19230, E024.84041, in case you want to drop in. Actually, here it is in Google Maps. It is a really good location but unfortunately there are absolutely millions of bees. So you probably don’t really want to drop in. The bees make it very hard to do anything. A nightmare in fact. So we might have to move on, or it could be just the season. I have to type this in my tent. And we don’t get good satellite connection here so, to send this, I will have to paddle out to the middle of the Lomami. 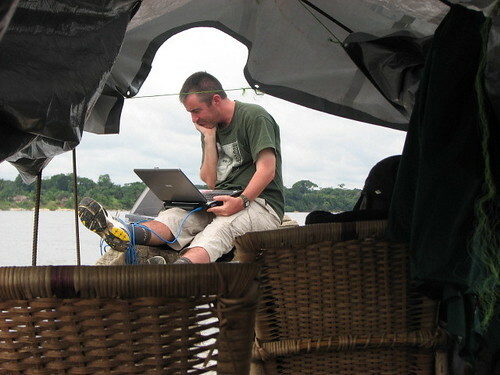 Ashley connected from the middle of the Lomami River with a Bgan (behind the laptop). This entry was written by Terese Hart, posted on 2007-06-26 at 9:18 pm, filed under Bonobo. Bookmark the permalink. Follow any comments here with the RSS feed for this post. Post a comment or leave a trackback: Trackback URL. I was not too familiar with the Bonobo species until I saw a clip on a video game forum of Kanzi (the famous Bonobo in America) playing Pac Man (he was very good and VERY intense, by the way). Too bad you only got a few seconds of video, I would like to see them in the wild. Hopefully there will be more video and more photos by the time the exploration is done…probably by the end of the year. Then we will make the teams bigger and start more detailed inventory in the forests. There are a couple groups of Bonobo in semi-captivity in Kinshasa. They were all rescued from captivity. Fascinating to watch them. Ashley is off on a circuit now. Hi Terese, I will definitely check the blog near the end of the year for video and photos. Terese and John You both are doing such wonderful things, your selfless and courageous! Thanks for everything your doing for animals your both an inspiration!